Do you know the differences between computer mice? Did you know there were a number of different kinds? Well, today let's look at some of the choices. 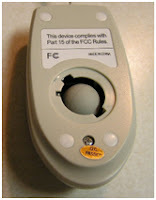 The old style mouse was a mechanical mouse, easily identified because on the bottom side of the mouse, you would find a ball that tracked your movement and translated that movement to the screen. This mouse worked best on a mousepad and often needed cleaning. An optical mouse uses an LED to detect movement relative to a surface. The laser mouse uses an infrared laser diode instead of a LED to illuminate the surface beneath their sensor. These mice generally cannot track on glossy and transparent surfaces. These are powered by the computer. A trackball mouse is almost an upside down mechanical mouse. It can be manual or have laser tracking. This works well if you don't have a lot of space and you will never have tangled cords or never need to readjust the mouse for scrolling. Of course, you won't have tangled cords if you use a wireless mouse, often utilizing a small USB Wireless receiver plugged into your computer. Wireless mice have batteries that will need to be replaced occasionally. Last, the stylus mouse is like a pen. Sometimes is part of a pen and tablet set. The stylus mouse is often used for writing notes on a presentation, for example, with special software. The pen and tablet are often used by computer graphic designers to draw directly into the computer. The pen and tablet are easier to manipulate than a traditional mouse. best ergonomic mouse is the perfect weight and tracks well. It fits my hand perfectly. It works over Bluetooth.